When is the tax extension deadline for 2013? The tax return deadline is fast approaching and if you feel that you need additional time to file your returns, you can file for a tax extension. When do you need to file your tax extension? April 15, 2013 (on or before) – Due date for Tax Extensions for 2012 Federal Income Tax Returns. October 15, 2013 – Last day to efile a 2012 Income Tax Return for Tax Extension filers and late Tax Return filers. 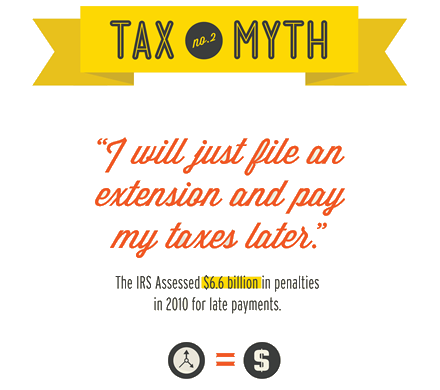 It is very important to know that an extension to file taxes is not the same as extension to pay taxes. If you owe taxes, you have to make a payment on or before April 15 for at least 90% of your estimated liability or face interest and penalties. If you miss a tax extension deadline, you can no longer file for extension but you can still file your tax returns. You should still file an extension to file taxes even if you expect a refund. The only difference is that you do not have to make any payments as any penalty is accessed on the amount you owe. How to file for tax extension? Fill our Form 4868 and send to appropriate address; that information can be found in instructions for Form 4868. File Form 4868 electronically using IRS’s FreeFile service; FreeFile will open on January 30, 2013. Most tax preparation software let you file for extension directly from their websites. State tax extension vary between states for that reason you should visit your state website for more detailed information. How to make a payment of tax liability with application for extension to file taxes? If you make a payment electronically through EFTPS, you will receive a payment confirmation number that you should keep for your records. If you file for extension with Form 4868, include a check or money order with the form. Make sure it is payable to the United States Treasury. What if you live abroad? U.S. citizens or resident aliens living abroad are granted additional 2 months to file taxes. This year that deadline is June 17, 2013. You can also qualify for a special tax treatment if you meet the foreign residence or physical presence test. If you need extra time to meet any of those two requirements, File Form 2350. What are the penalties for filing taxes late? 5% of the amount due for each month for the maximum of 25%. For returns more than 60 days late, the minimum penalty is $135. What are the late payment penalties? One-half of 1% of any tax not paid by April 15, 2013. It is charged monthly for the maximum penalty of 25%. If you pay at least 90% of the actual tax owed at the deadline, you will not face penalty payment for late payment. Form 4868 and instructions – Application for Automatic Extension Of Time to File U.S. Individual Income Tax Return. Form 2350 – Application for Extension of Time to File U.S. Income Tax Return (for U.S. citizens and resident aliens living abroad).